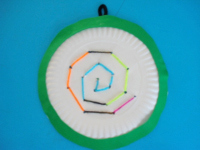 Introduce children to stitching with this simple project. 1. Gather your material. 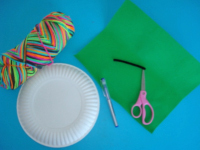 You will need Fun Foam, colourful yarn, a paper plate, scissors, adhesive tape (not shown), a short pipe cleaner, a crayon or pen, and white glue (not shown). 2. 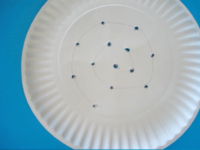 Turn the paper plate over and lightly draw a simple shape or figure. I recommend using a pencil for this step so you can erase the lines. I chose to draw a swirling pattern, but you could easily draw a flower, a triangle, a square, etc. Every few centimetres along the outline you have drawn, use the crayon or pen to punch a hole. 3. 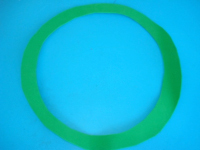 Cut a long piece of yarn and wrap one end with adhesive tape to make stitching easier. 4. Insert the wrapped end of the yarn through the first hole and pull it through completely. Secure the other end of the yarn by tying a large knot. 5. 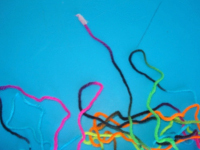 Continue stitching/lacing the yarn through the holes along your outline, always threading it through the previous hole. When you reach the final hole, tie a knot and cut any excess yarn. 6. 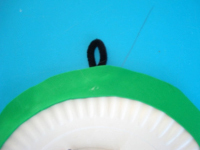 Trace the contour of the paper plate on the Fun Foam and cut out the circle. 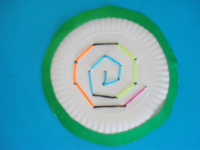 Next, cut out the centre of the Fun Foam circle to create a frame that will represent an embroidery hoop. 7. 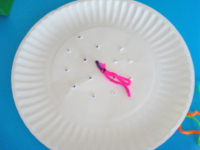 Glue it over your paper plate. 8. 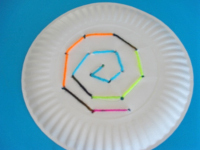 Use the pipe cleaner piece to form a loop and glue it behind your masterpiece. Hang it on a wall. This embroidery project makes a great Mother's Day gift for grandmothers.